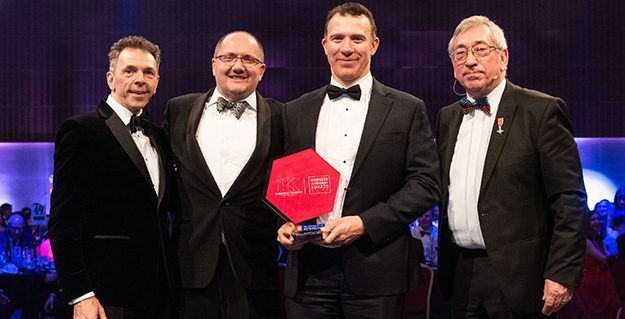 Integral Powertrain Ltd (IP) is delighted to have scooped a double victory at last night’s Milton Keynes Business Achievement Awards (MKBAA), winning the prestigious Business of the Year award, as well as being recognised for hard-work and dedication to Innovation and Technology. Held to recognise the achievements of Milton Keynes businesses within a variety of sizes and sectors, the Marshall Stadium, MK was bursting with various vibrant local companies, all celebrating the amazing work happening in the city. The judges felt that Integral Powertrain were worthy winners of the Technology Business of the year award. They said that the sophisticated electrical technology demonstrates how electrification of the powertrain can beat the internal combustion engine. Their technology is genuinely frontier in its application. Integral Powertrain Ltd manufactures high performance electric motors and control technology for automotive, motorsport and aerospace sectors. Employing over 170 staff across Milton Keynes, IP works with prestigious manufacturers and Tier 1 suppliers. Our engineers create innovative, complex and market leading powertrain and e-Drive solutions used across a wide range of applications. IP operates three divisions; Integral e-Drive, Integral e-Hub and Integral Powertrain employing over 170 people at its Milton Keynes Engineering and Emissions Centres.